The Frost School’s Studio Music and Jazz Instrumental Program offers students the chance to study with top professionals via an innovative, concentrated, and individualized curriculum. The program is designed to train the total musician, developing skills in performance, composition, arranging, studio recording/technology, and music business/entrepreneurship. Frost students are exposed to a wide range of improvisation-based music, from the traditional jazz canon through the most current trends, while having the opportunity to develop an individual voice and pursue a personal musical direction. The MSJ faculty includes numerous Grammy award winners and nominees, a MacArthur Genius Grant recipient, and veterans of the bands of Art Blakey, Horace Silver, Roy Haynes, Maria Schneider, Jack McDuff, Eddie Palmieri, Woody Herman, Buddy Rich and scores of other past and present jazz legends. Our jazz graduates can be found in all corners of the music industry, performing with current jazz masters (Jeff “Tain” Watts, Esperanza Spaulding, Roy Haynes, David Liebman), TV orchestras (Jimmy Kimmel and Saturday Night Live bands), pop stars (Gloria Estefan, James Taylor, Rolling Stones, Paul Simon) and behind the scenes in recording studios, orchestra pits, and ensembles of all types and sizes throughout the world. Many are also accomplished composers, conductors, producers, and music business entrepreneurs. Frost jazz graduates populate all the world’s major music centers, and hold teaching positions at over one hundred universities and arts academies across the globe. 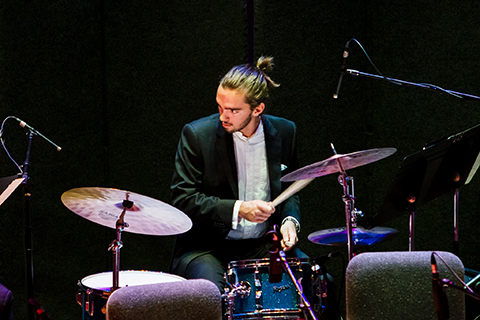 Frost students routinely win awards from organizations such as Downbeat, ASCAP, Betty Carter Jazz Ahead, Thelonious Monk Institute, and numerous national instrumental competitions. Frost jazz majors study one-on-one with a world-class private teacher each semester, along with courses in theory, keyboard, ear training, improvisation, arranging, composition, jazz history, music technology, and the business of music. At the core of the experiential curriculum is doing, and Frost students spend most of their time making music. The ensemble program includes both big bands and small groups, concentrating on a wide array of genres including classic bop, hard bop, post-bop, Latin, fusion, “ECM”, odd meter, Avant garde, and composer/theme ensembles dedicated to the music of the masters. Faculty artists Brian Lynch and Dafnis Prieto both mentor student-artist ensembles that feature both their own works and student compositions. Advanced students also can organize and direct their own ensembles for class credit. Departmental student performances are scheduled twice a week, and numerous acclaimed international guest artists perform and lecture on campus each year. Recent artist residencies include Dave Holland, David Liebman, Chris Potter, Kenny Barron, Alan Ferber, Christian McBride, Jason Moran, Maria Schneider, and Joshua Redman. The Frost Henry Mancini Institute, under the artistic direction of James Newton Howard, affords students the opportunity to perform large-format works in conjunction with world renown guest performers, composers, and conductors. Our jazz community is a recording culture! Jazz majors have access to four state-of-the-art recording facilities: the department’s own dedicated recording studio, the Weeks studio, the Gusman Hall Studio, and the film/media production lab. Find out more about Frost facilities, including the new Patricia L. Frost Faculty Studios, and visit our YouTube channel. In addition to experiencing music on-campus, the greater Miami metropolitan area (population: five million) is rich with international, multiethnic opportunities for gigging, study, and fun. Students perform regularly in clubs, cafes, concert halls, and various other live venues. Frost students can also study abroad for a semester at four partner institutions located in Europe and Australia, and can participate in a five-year program combining the undergraduate performance degree with master’s in jazz pedagogy, effectively saving an entire year of graduate tuition. We invite you to contact Frost music admissions and schedule a visit to view in person the unique advantages of studying Studio Music and Jazz at Frost.